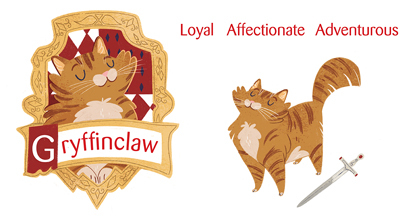 The Sorting Cat: Which Mogwarts house does your cat belong to? As any Harry Potter fan will know, cats are a witch or wizard’s best friend. From Hermione’s faithful moggy Crookshanks, to Professor McGonagall’s tabby Animagus, there are many felines roaming the halls of Hogwarts. Therefore, we thought it was about time that our feline friends had their own school of witchcraft and wizardry. 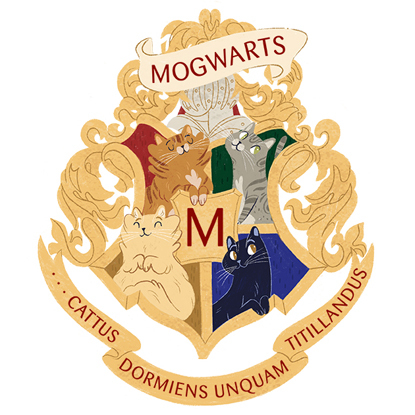 Acceptance letters for Mogwarts will be delivered by owl to moggies across the world very soon, and then each new pupil will be sorted into a house. 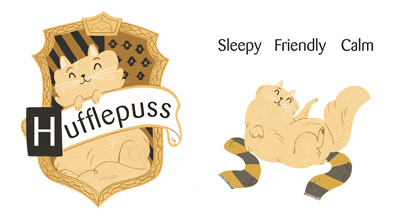 So which house do you think the Sorting Cat will pick for your pet? 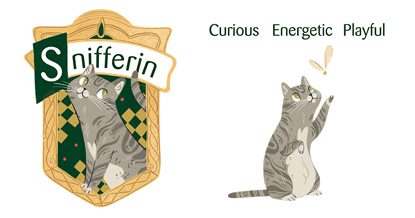 Are they a friendly Hufflepuss, a loyal Gryffinclaw, a smart Ravenpaw or a curious Snifferin? Let us know in the comments below or on Facebook or Twitter. Do you have a sleepy kitty who loves a cosy cat nap? Do they like to roll over and show you their furry tummy and purr when you give them a fuss? If you have a friendly feline who likes to calmly wander around their kingdom, then they certainly belong in Hufflepuss. If your little lion is always by your side, rubbing their cheeks up against your ankles and nuzzling you with their nose then you have a loyal and affectionate Gryffinclaw. They love to go on adventures, whether it’s climbing on the furniture or chasing that catnip mouse around the bedroom at 5am. Has your moggy worked out exactly when their next meal is due and will let you know about it with an urgent meow? 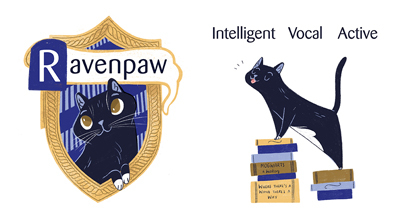 Ravenpaws are highly intelligent and are also very vocal about it. They like to stay active though, to burn off all that energy from their dinner. If you have a curious cat who is always sniffing out new places to explore then they would make a great Snifferin. These mogs are energetic and playful, always leaping and pouncing on anything that moves – so make sure you keep your fingers and toes out of the way! Erm our cats are a little of everything, would that make them Difurgent? See what I did there? Gryffinclaw is definitely my Miss GingerBirdie (3yrs) House. And my Jack Frostytoes (8ys) house is definately Ravenpaw. I have a Gryffinclaw boy alright,not sure about the other two.The little girl is a timid little thing and scared of her shadow but loves to attract attention when she's hungry.🍲The other older lad is the other older lad is the Garbo of cats and wants to be alone.😄😄They are all mouseketeeers though.🐁🐁🐁🐁. My kitten, from CP is called professor Minerva McGonagall, minny for short. She's not a Griffynpaw though, definitely a ravenpaw. Always climbing in the book case!